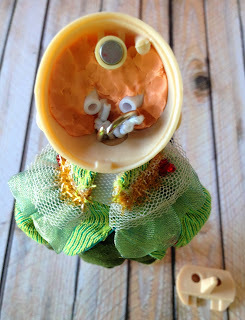 Tuesday Morning happens to be one of my favorite places to search for dollie treasures because you just never know what you are going to find there. My oldest daughter stopped by Tuesday Morning a couple days ago, and she was so excited to call to tell me that she had found some Ball Jointed Dolls. 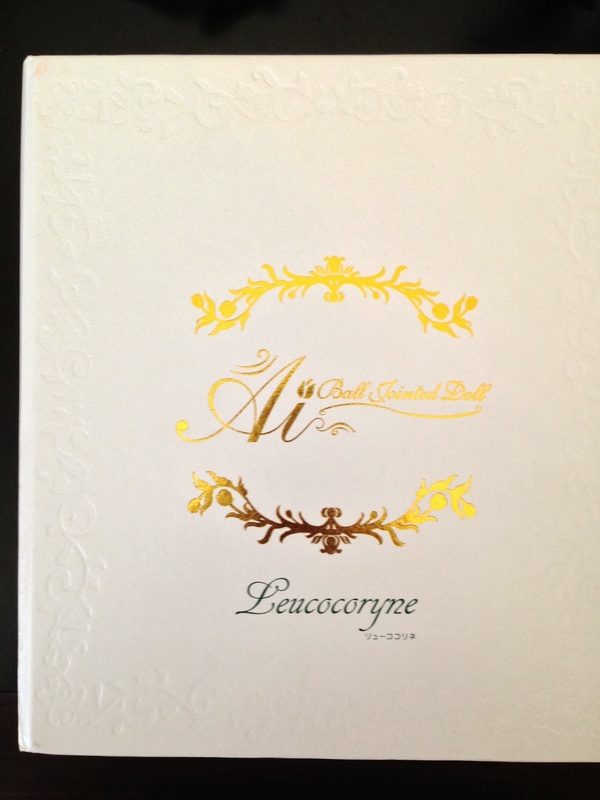 They were Ai Ball Jointed Dolls from Jun Planning, which is the same company that makes Pullip dolls. She brought home one of each of the two Ball Jointed Dolls that they had in stock. If you've ever been interested in Ball Jointed Dolls, but were put off by the price, you may want to check out your Tuesday Morning for these little cuties. 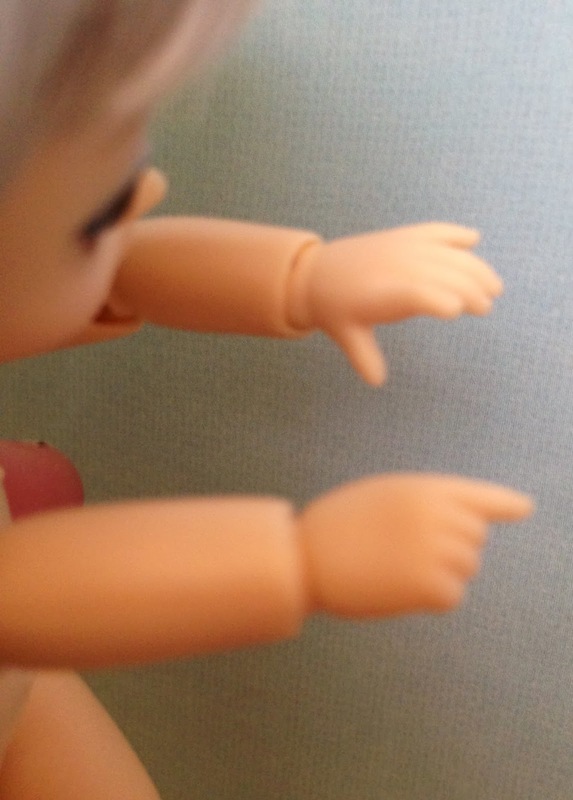 Ball Jointed Dolls can be very expensive, easily ten times what these little dolls cost or more. Tuesday Morning's price is just $29.99, so it's a very affordable alternative to ordering an expensive Asian Ball Jointed Doll if you'd like to give BJD's a try. The dolls come packaged in a lovely white storybook style box with an embossed vine border around the edge and gold foil writing in the center that says Ai Ball Jointed Doll. Underneath, is the doll's name, "Thyme", in blue. When you open the cover of the book, inside is little Thyme and her accessories. There is a clear protective cover that lifts up to access the satin covered cushion. 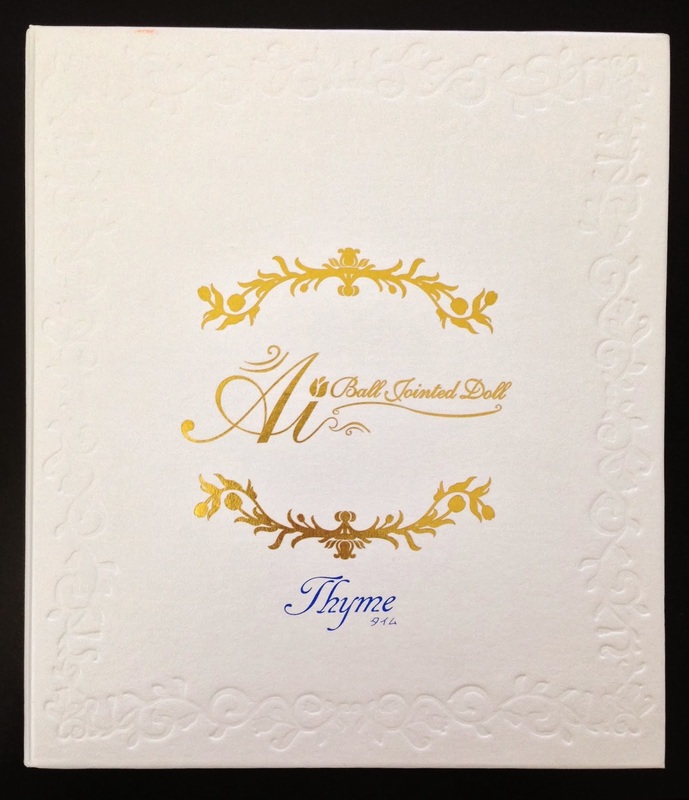 Simply untie the satin ribbons to easily free Thyme from her box. No plastic ties to cut and no cardboard or rubber bands. 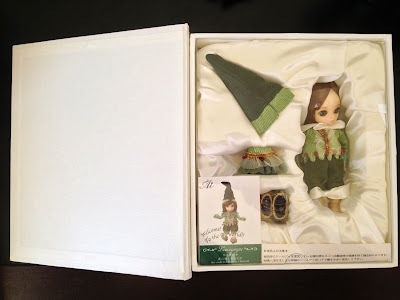 I wish all dolls were packaged like this. Thyme can stand well on her own, straight out of the box. She stands about 14cm. tall or about 5 1/2". She has blue eyes and platinum hair with ringlets styled in two ponytails. 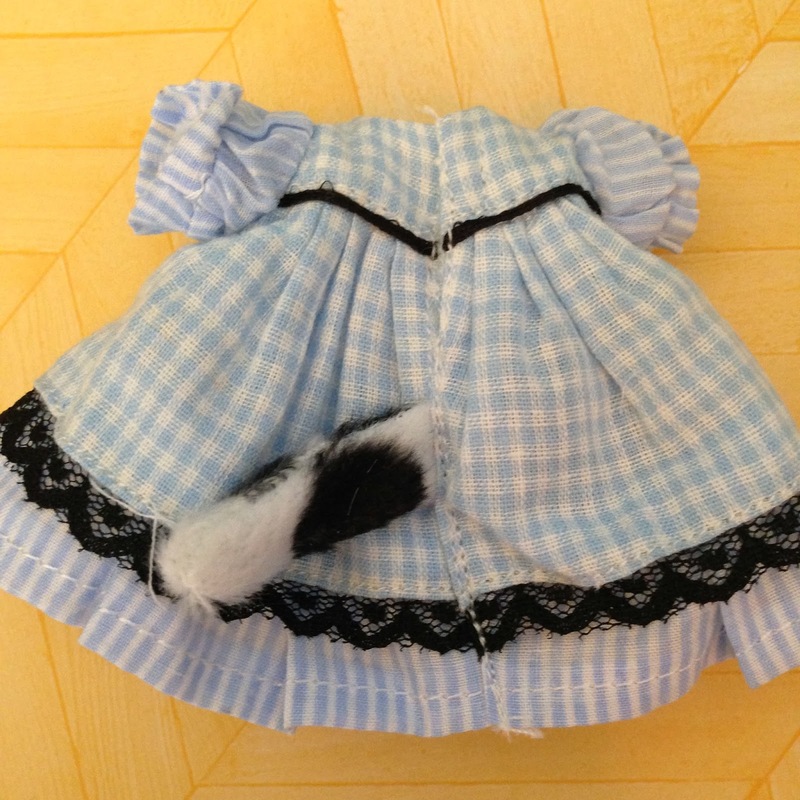 Her accessories include a blue and white gingham dress with black lace trim, a white lacy petticoat, white tights, black mary jane shoes, a furry cowprint collar, a cowprint hand muff, and a cowprint hat with gingham lining. The back of her dress has a little furry cow tail. Below are some pictures of her undressed to show her ball joints, her posability, and how she is put together for anyone new to BJD's. She is jointed at the neck, shoulders, elbows, wrists, hips, knees, and ankles. 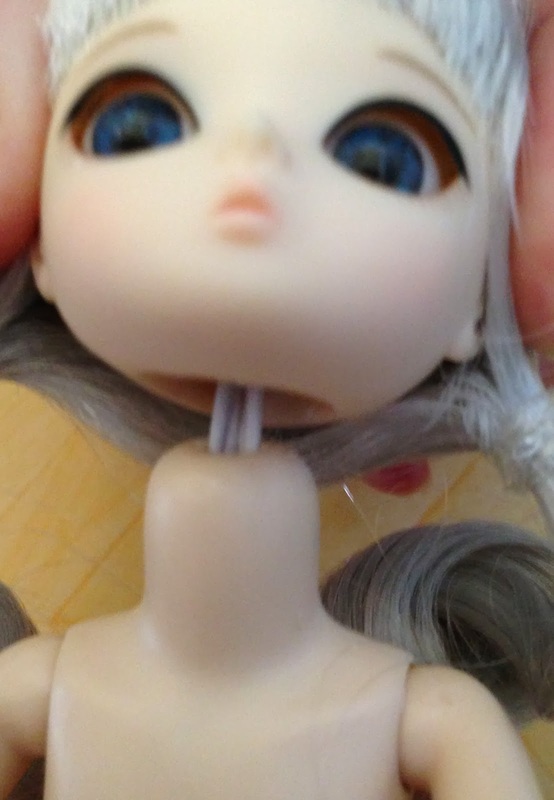 Like other BJD's, she is strung, which means there is elastic which runs through her body holding her together. BJD's are strung, which is one thing that makes them different from other dolls like Barbie, Monster High, American Girls, etc. 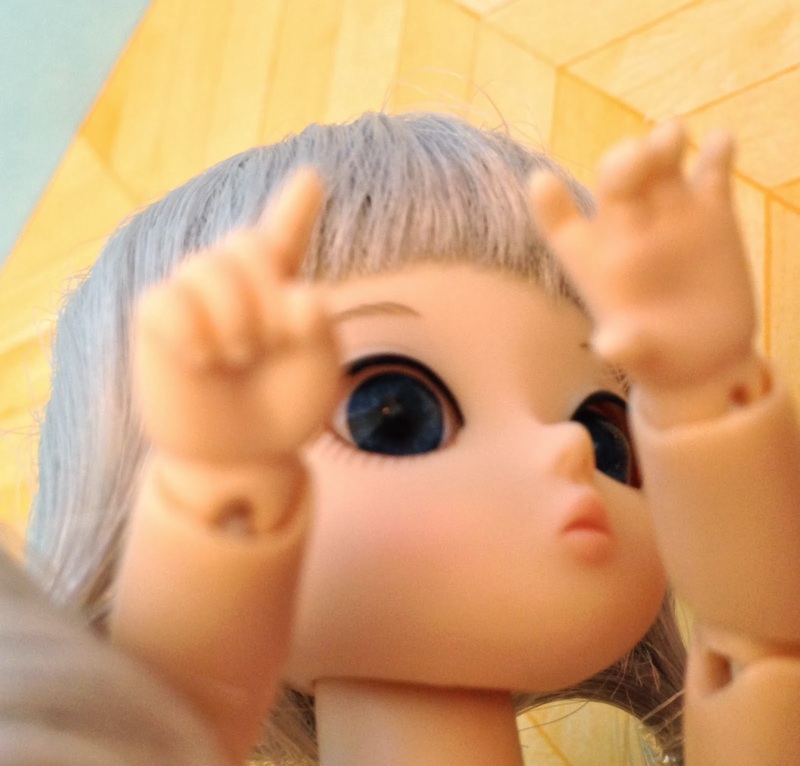 BJD's are more posable than other dolls. Here, I'm pulling on her foot to show the elastic that runs through her leg so you can see how she is strung. Here you can see how her arms are strung the same way. If I pull up on her head, you can see the elastic that runs through her body and into her head. Her wig is attached to her head cap with Velcro. 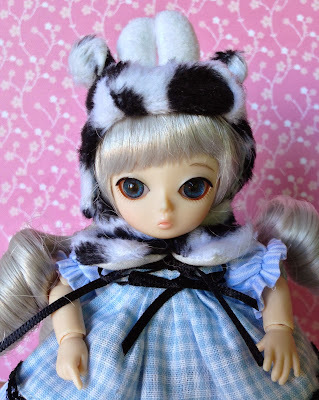 It can easily be changed to a different wig, since BJD's are designed to be customized. This shows the Velcro on the top of the head cap and the inside of the wig. The headcap comes off easily, and is attached by a magnet. Inside the head, you can see that the elastic is attached to a ring. 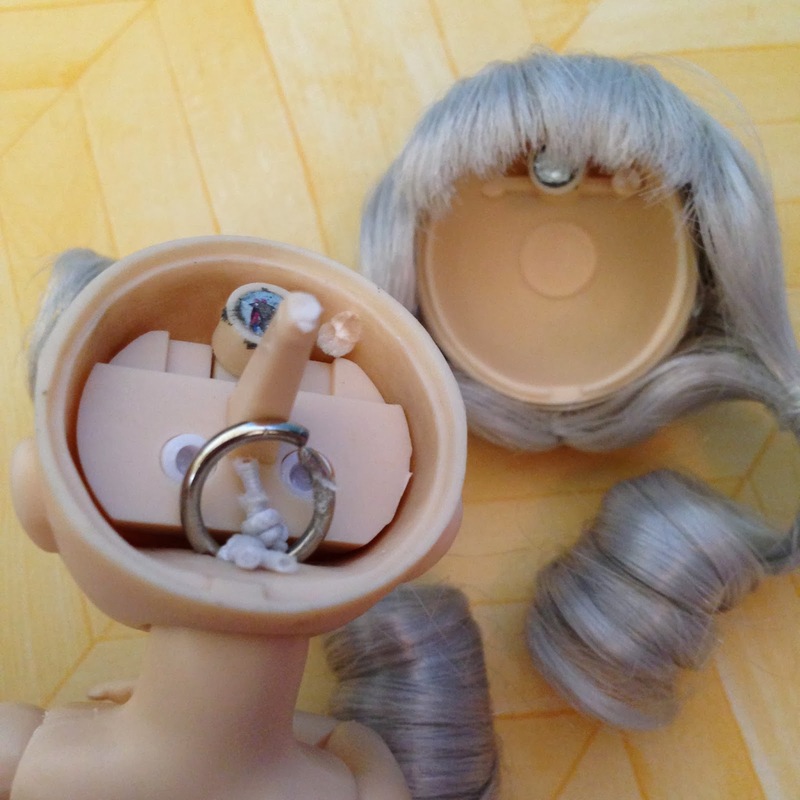 By pulling the ring out of the way and lifting out the part underneath, you can see the back of the eyes. 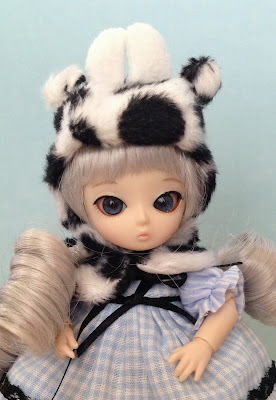 BJD are designed so that the eyes can be changed for customizing. This doll is no exception. You can easily change her eyes. Her eyes are held in place by the little part you see in the picture below. She also comes with a block of eye putty, which can be used instead to hold the eyes in place. 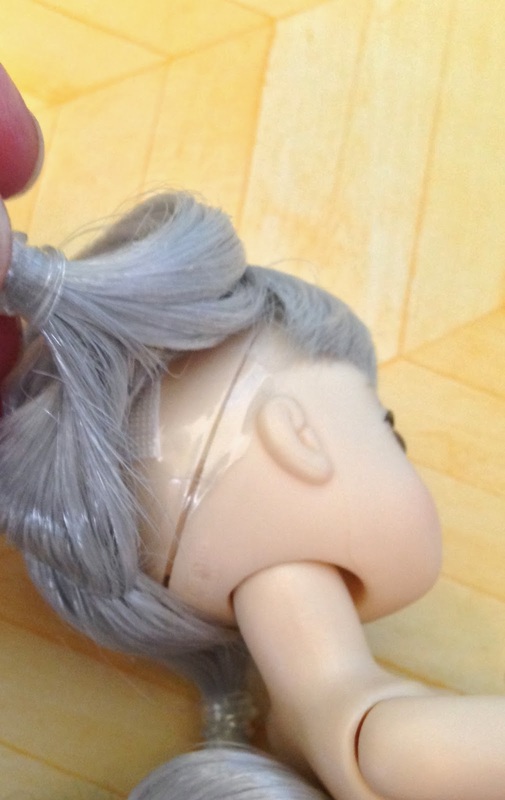 I hope seeing inside the head and the stringing doesn't creep you out too much, but those are the mechanics of a Ball Jointed Doll. 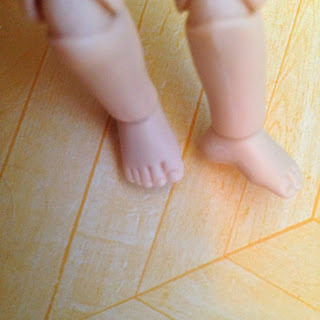 I just wanted to show this for anyone who is new to BJD's. Now back to cute little Thyme. She has the most adorable little hands. My camera just can't capture the amazing sculpting of her little feet. She can touch her face, and she can hold whatever position that you put her in pretty well. Here she is dressed back in her complete outfit that she came with. 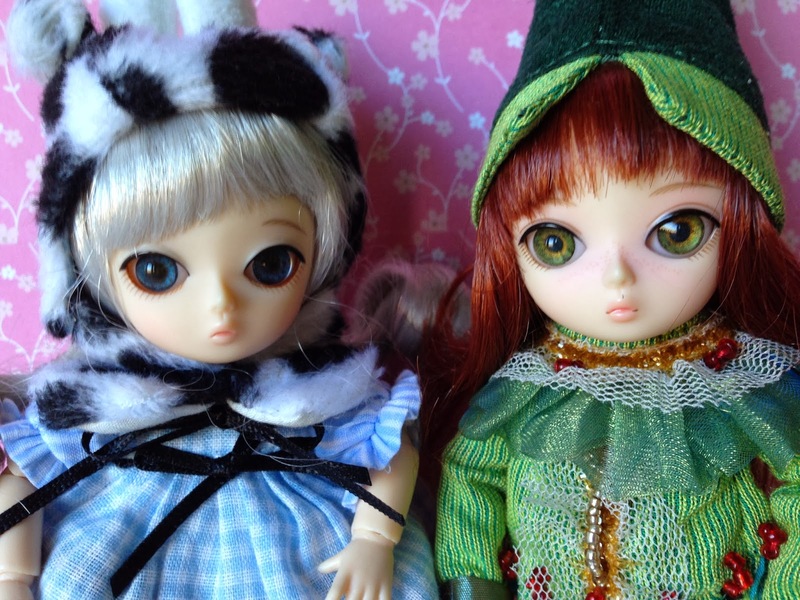 Here is Thyme with Rosalee, my Fairyland Littlefee. Rosalee is about 10 1/2" tall compared to Thyme's 5 1/2". Thyme could be Rosalee's little sister. The other Ai Ball Jointed Doll that my daughter found at Tuesday Morning was Leucocoryne. Here she is in her storybook box. She reminds me of a little elf. The details of her outfit are amazing. She wears a green and yellow striped top with a scalloped hem that is decorated with tiny red beads. She has a separate ruffled collar with bead details. She has forest green knee length pants and gold stockings. Her green shoes are decorated with ruffles and a gold trim. 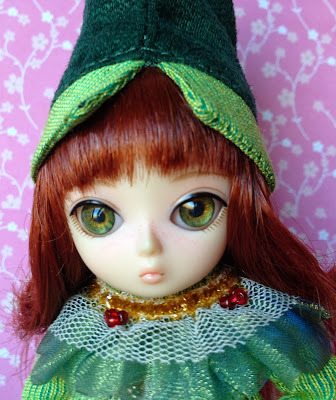 She has a tall green elf hat. She has red hair, green eyes, and a sprinkling of tiny freckles across her nose. How do these dolls differ from other expensive Asian Ball Jointed Dolls? 1. 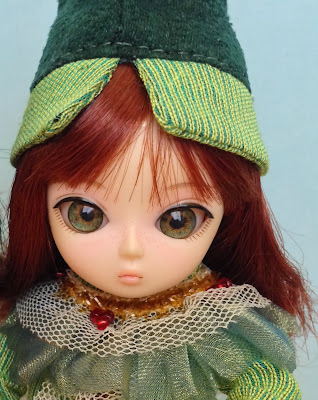 One of the differences between these BJD's and a lot of high end BJD's is that they are made of plastic, possibly ABS like the Hujoo Ball Jointed Dolls, instead of resin like other very expensive BJD's. I can't tell the difference actually, but I found this information out from researching these little dolls online. 2. 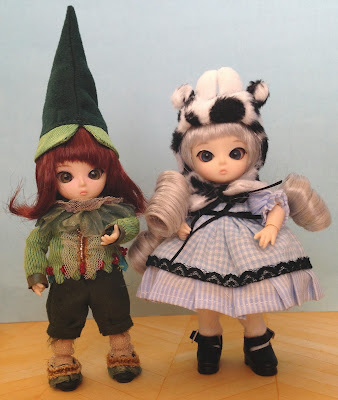 The only other difference that I've been able to find is that these little dolls come with clothes, wig, eyes, and a face up (their face paint). 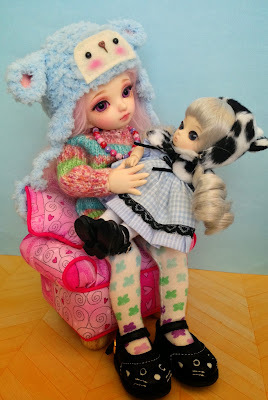 BJD's usually do not come with clothes, wig or faceup, because they are designed to be customized. 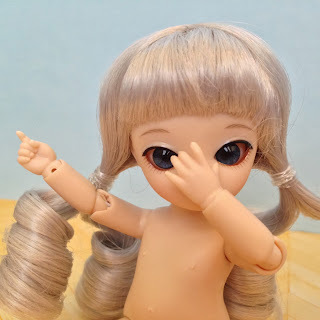 When you order a BJD though, you do have the option of paying extra for a factory faceup, and you can even order dolls as a "full set", so that they come with clothes and a wig which costs more too. 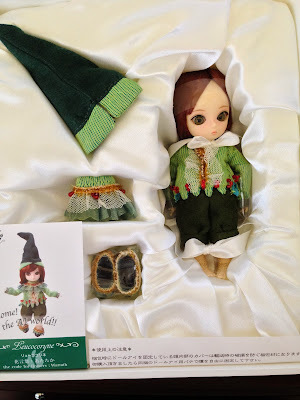 These little dolls do come complete so that you can enjoy them just as they are, but they are still made to be completely customizable just like any other BJD. I would recommend these adorable little BJD's, especially if you are looking for an affordable way to add a BJD to your doll collection. Check your local Tuesday Morning to see these sweet little dolls in person. If your Tuesday Morning doesn't have any in stock, search for Ai Ball Jointed Dolls on Amazon. Amazon has many of them at the same price as Tuesday Morning, $29.99, although some are much higher. 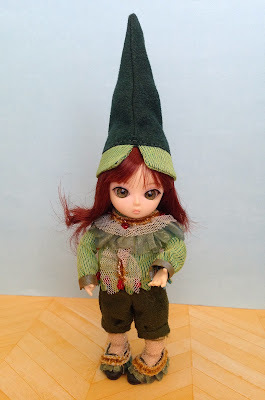 Since this post is already so long, I'll tell you about the other adorable dolls that my daughter brought home from Tuesday Morning in the next post. Thanks to Barb for posting a comment below to ask about their eyes. Their eyes can be adjusted or completely changed out for different eyes. The manufacturer also provides eye putty with each doll. I had not tried to adjust their eyes or use the eye putty in any of the previous pictures, and they looked a little cross-eyed. So today I decided to adjust their eyes. 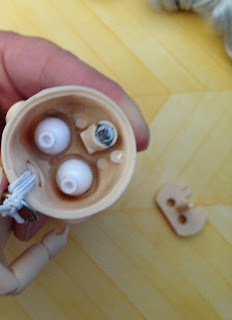 When you remove the head cap (held on with a magnet), there is a plastic cover that holds the eyes in place. I removed that plastic piece, and used the eye putty to hold the eyes in place. Their heads are small, but it was still pretty easy to do. I used the rounded end of a paint brush to push the eye putty in to hold the eyes in place. Here is what it looked like on the inside of the head after I got the eyes adjusted. Here are Thyme's before and after pictures. Here are Leucocoryne's before and after pictures. I'm happy that I took the time to adjust their eyes. They still might not be adjusted just right, but I think they look better. What do y'all think? I know, I feel exactly the same way about Tuesday Morning. Lots of times, it seems they have nothing new, then all the sudden they get something great! You have to catch it at the right time though, because I guess the good stuff goes really fast. Recently I found J-Dolls there too, and they had about a dozen different ones, all $19.99 each. I bought one, not really knowing much about them at the time. After researching them, I went back just a couple days later to look again, and they were all completely gone. There were so many that I was very surprised that they all went so fast. My Tuesday Morning had those dolls also: Bee Balm, Leprospermum and Iris. I fell in love with Bee Balm. I like your selection also. Maybe I can find lecorcyn., love the outfit and red hair. Simsgrl, It's so neat that your Tuesday Morning had completely different ones. I hope to get to some other TM's in the surrounding area to see what other versions they might have. I had to look up the ones you saw, and I love Bee Balm too! Her little bee costume is adorable!!! The dolls look a little cross-eyed to me. Is there any way to correct that, perhaps with different eyes? Thanks so much for your comment Barb. Yes, the eyes can be replaced with different eyes, or you can adjust the position of the eyes that they came with. The company also provides eye putty with each doll that you can use to reposition the eyes. I decided to give it a try this morning. There is an update at the bottom of the post with new before and after pictures. Please let me know what you think. Thanks again! Wow, thanks for the mention! I think they do look a lot better with straighter eyes. I might have to stop at Tuesday Morning! My Thyme doll is actually marked resin? Feedback on that? Thanks! Really? Where did you find the resin marking? I was just going by what I read online about them. I really can't tell if they are resin or plastic from looking at them or even by how they feel. Please let me know where you found the marking so I can check my Thyme. I'll let you know what I find. Hi Natalie! Congratulations on your adorable little Plum! She is just precious. I love her little pearl headband. Thank you for the link to your Flickr. I enjoyed seeing all your pictures. 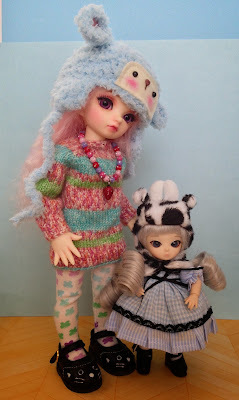 I especially liked the ones where Plum met mini Blythe. I loved your dollhouse pictures too. I have just started on my first dollhouse kit. 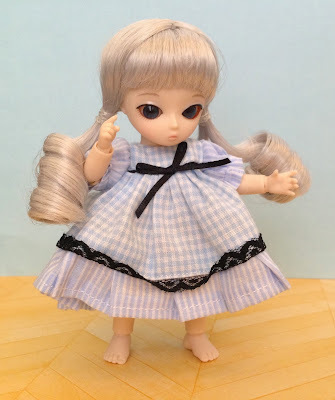 When comparing the Jun Planning Ai BJDs to Amelia Thimble, I would say that Ai dolls would come closer to wearing Puki size clothes. Amelia Thimble's body is just so much thinner. Amelia is very slender and delicate. She can't stand on her own. I would definitely recommend an Ai for both posability and price. 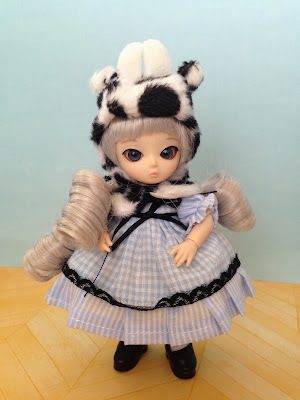 I just bought my first ball jointed doll at Tuesday morning today. Her name is Cuphea, she is really cute. Thank you so much for the review! I had no idea what the putty was for until now. How exciting!!! I'm so happy for you! Cuphea is adorable! I love her little gingham dress and bonnet. She even has her own cute little pig pet. Precious!!! Congratulations on adding her to your collection! My Tuesday morning had four dolls, The elf above, Cosmos ( a nurse), Phlox (a girl dressed as a peach), and Freesia a Little boy who looked like he was in a white christening gown. I bought Phlox and i couldn't be more happy with my purchase..I just wish I knew more about what size eyes they have I want to order her different eyes! Hi Amy! 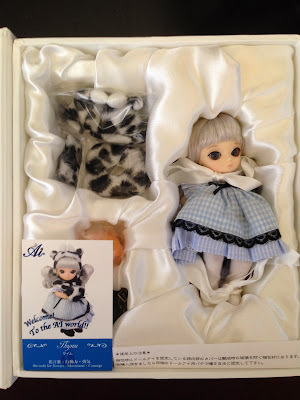 I'm so glad to hear that you found Ai dolls at your Tuesday Morning and that you brought home Phlox! She is adorable!!! She has the sweetest face, precious hair, and her outfit is too cute!!! From what I've read, Ai dolls can wear size 10mm eyes. 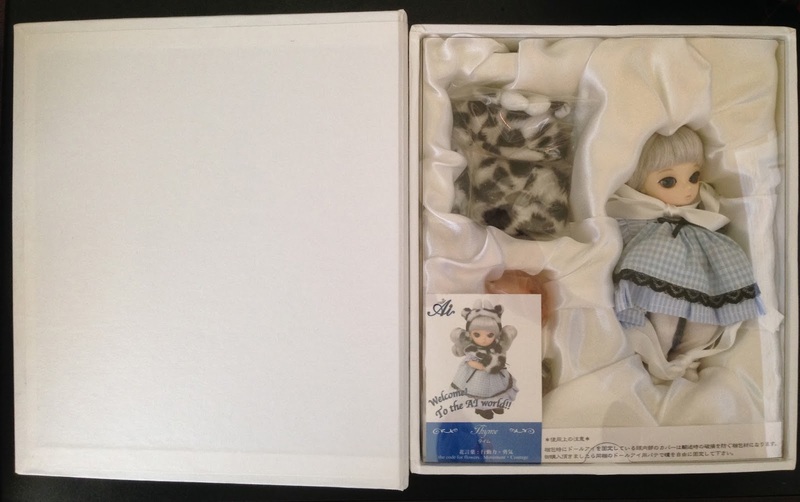 I just brought home a new Ai doll too, so look for another Ai post soon to introduce my new one. Thank you for the info on where to get them. I looked everywhere until last minute found one. I still haven't found any Pullips, ugh. Hopefully next time. My drives an hour half to get to one. If you know where to get wigs and clothing for them. I'm all ears! 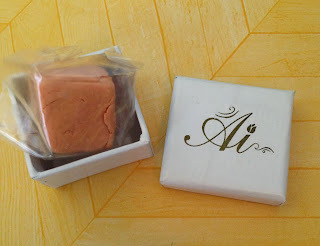 Mrs. Macarons, I'm so glad that you found your first little Ai BJD at Tuesday Morning! The thrill of the hunt! 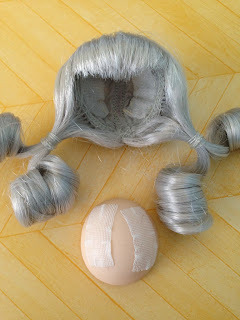 :) I have read that Ai dolls may be able to wear a size 4 or 5 wig, but I haven't tried any other wigs on my Ai dolls. They may be able to wear Pukifee or Lati Yellow clothes, but again I haven't tried any on to see if they fit. You may want to check with http://denverdoll.com/ for possible wigs and clothes. Well, I went to Tuesday Morning this afternoon to find a picture frame but ended up with my precious little Sanbitalia. There was one other but her hair was so messy, she didn't appear cute to me. now that I'm home, I looked them up to see what others were available....I can't wait to explore more. Sadly i went to two Tuesday Morning stores and neither one of them had Ai, or Jdolls I was so sad about it. I tried to as someone at one if they had them just not in stock and was told I need the code number printed on the price tag to be able to look them up. I will probably end up calling again on Monday instead of wasting the gas. I found 5 total in my two Tuesday Mornings. Hadn't tried another town yet though. I'd asked if anyone could help me with some info on the head magnets as I've just ordered a doll off ebay and have since read that some owners have found that the head is covered in metal magnetic fillings rather than the solid magnet it should be. Whilst the doll is for me, i know my four year old wont be able to resist it and I dont want anything dangerous.